dfilt.scalar(g) returns a discrete-time, scalar filter object with gain g, where g is a scalar. dfilt.scalar returns a default, discrete-time scalar gain filter object hd, with gain 1. In this table you see the properties associated with the scalar implementation of dfilt objects. Specifies whether the filter automatically chooses the proper fraction length to represent filter coefficients without overflowing. Turning this off by setting the value to false enables you to change the CoeffFracLength property to specify the precision used. Set the fraction length the filter uses to interpret coefficients. CoeffFracLength is always available, but it is read-only until you set CoeffAutoScale to false. Returns the gain for the scalar filter. 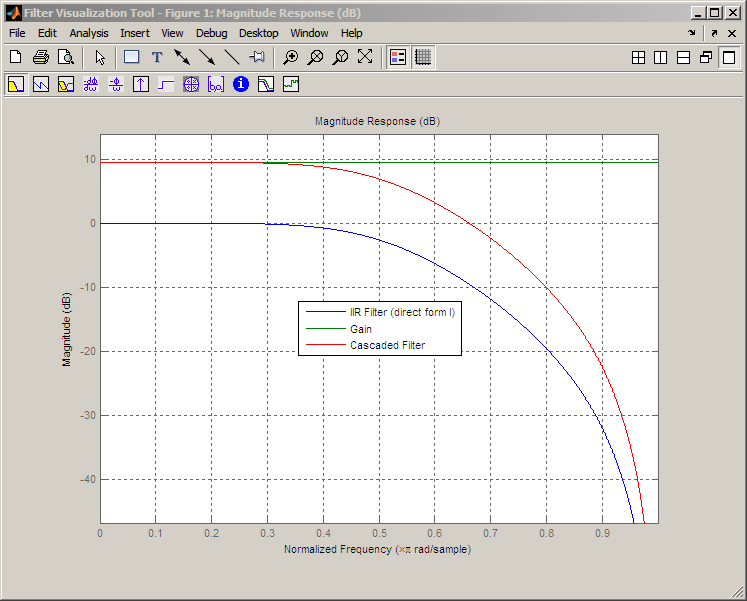 Scalar filters do not alter the input data except by adding gain. Create a direct-form I filter object hd_filt and a scalar object with a gain of 3 hd_gain and cascade them together.